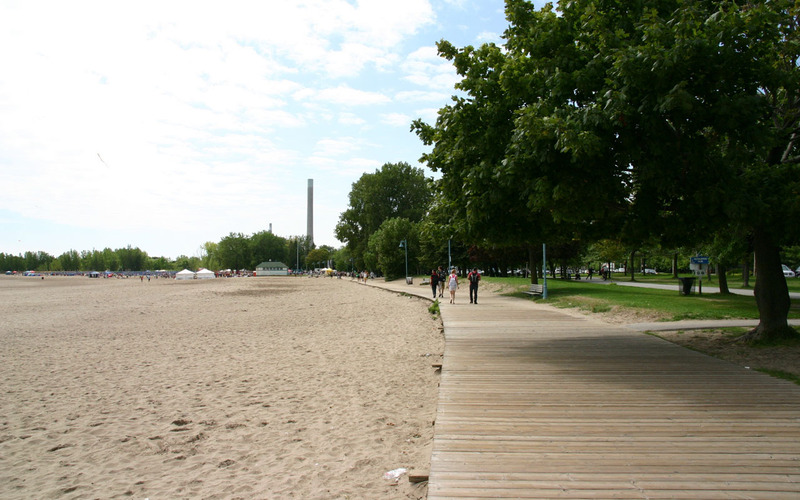 A broad and beautiful curve of sand at the foot of Woodbine Avenue, this popular 15.2 hectare park is one of the city's many beaches and the gateway to three kilometres of sandy waterfront stretching eastward along the Lake Ontario shoreline. Woodbine Beach is a popular spot for picnics, sunbathing and swimming with wide stretches of sand, summer lifeguards, a bathing station and the Donald D. Summerville Outdoor Olympic Pool nearby. The recently renovated bathing station features upgraded ventilation and lighting, a new roof, an enlarged patio, change rooms, accessible washrooms, water bottle filling stations and a beach shower with a foot wash. The Ashbridges Bay and Martin Goodman trails run through this park, which also includes a playground, outdoor fitness equipment, beach volleyball courts, picnic shelters, snack bar, full-service restaurant and parking at Ashbridges Bay Park. ACCESSIBILITY - A plastic Mobi mat system leads from the base of the Summerville Pool to the shoreline, enabling mobility devices to access the sand and water. A beach wheelchair is available in summer - call 392-7688 to book. LOCATION - In the historic Beach neighbourhood south of Queen Street East, a vibrant street with an eclectic mix of shops, cafes, pubs and restaurants.